Bruce Fire and Safety — you can depend on us to provide the best quality fire and safety protection for your commercial and residential needs. Licensed through the Florida and the Georgia state fire marshal offices, we have been proudly serving the North Florida and South Georgia area for over thirty-six years. We can handle any job you need ranging from portable fire extinguisher service, restaurant and industrial fire suppression system service, kitchen exhaust hood cleaning, scuba hydro-test, dry ice, to emergency and exit lights. We also offer fire protection training for your employees. On top of that we provide refills on C-O-2 cylinders, and hydrostatic testing for high and low pressure cylinders. Bruce Fire and Safety Equipment Company offers many products and services from a wide variety of manufacturer names including Amerex, Ansul, and Pyrochem. 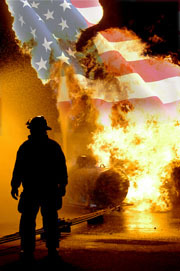 Currently licensed in FL and GA "serving a 200 mile radius of Tallahassee, FL"
Bruce Fire & Safety Equip. Inc.